Boston is a lovely city, like many other simply wonderful and enjoyable places, but I've never quite been able to explain the deep resonating loyalty and family that comes with calling it home. It's a phenomenon that I've found in many current and past residents, and one that is rarely spoken about because it is strangely understood. Perhaps it's the camaraderie that comes with trudging through another winter—but Boston's aren't the coldest. Perhaps it's a boiling of the brain through stifling summers—but Boston's aren't the hottest. In my experience, Boston is happiest when it's rallying its support—trying its hardest—and revels in falling short because that calls for louder cries next time. And there is always a next time. But rather than a city of losers, this is Title City! Good sports, good arts and culture, and even good smarts. Boston is a city of people talking to one another; finding common ground and interacting with their surroundings. It is an experience largely the same across utterly different demographics. 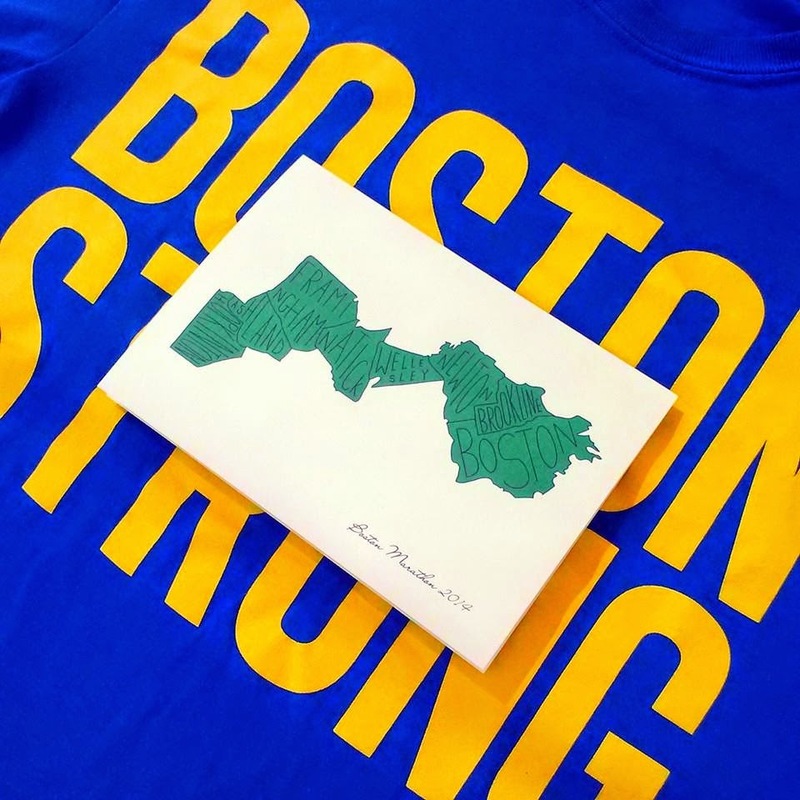 I've had the pleasure of creating two successful Boston prints in the past, a typographic Marathon Route Map being one of them, and this year I'm proud to have worked with some upcoming runners to adapt the print and produce thank you cards to share with their supporters. I love working with this design and I look forward to developing it further in the future. As for right now however, while April 21st' marathon is getting closer, there is still time for a few last-minute orders if anyone is interested. Just email me at warrentales@gmail.com for more details. On April 21st, thousands of people will run the Marathon as usual, spurred on by millions of viewers as usual and that strange but ever-present feeling will reassert itself in the lining of all of them. Enjoy it, Boston. You've earned it. The inspiration for this post came from a Boston.com article about a photography project organized by Lucie Wicker, called “Why I Run: A Boston Marathon 2014 Project” which I think does a wonderful job of capturing the spirit. Thank you, Lucie! The full size 9"x16" print has been very popular and I'm really happy with how the notecards come out.